Arctic Reindeer is a family reindeer business where all the generations take part in the daily tasks of the farm. Reindeer herding has been the traditional livelihood of the family for centuries. Our farm provides activities with reindeer all year-round. 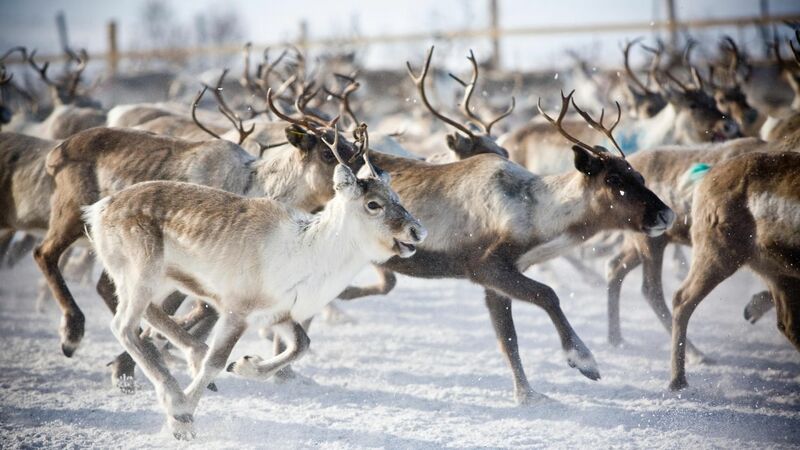 Arctic Reindeer Farm is located just 8 kilometers from the city center of Rovaniemi at the Arctic Circle. At the farm, Sámi culture meets the traditional lifestyle of Lapland as the family has roots from both Finnish and Sámi culture. The farm grounds consist of old logwood buildings creating a traditional setting in the midst of the forest. Our reindeer are half-wild-animals, and they were born in the wilderness. Though tamed and trained over years, our reindeer still possess a bit of wild spirit. We are happy to talk with you about your vision of what you want our reindeer to do in your film. With good conversation and preparations, we can find ways to accomplish your vision for filming reindeer. Miia Merkku knows the challenges in filming reindeer, and Arctic Reindeer is ready to meet those challenges head-on.